In a small bowl, combine the capers, parsley, bread crumbs, anchovy paste, and 2 tablespoons of the olive oil. Put the veal on a work surface and sprinkle 1/8 teaspoon salt and 1/8 teaspoon pepper over the meat. Put some of the stuffing near the bottom of each piece of veal. Roll the veal up loosely, enclosing the stuffing, and secure each piece with a toothpick. In a large deep frying pan, heat the remaining 2 tablespoons oil and the butter over moderate heat. 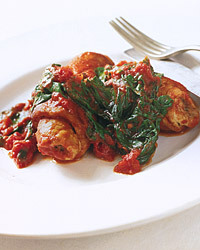 Add the veal rolls to the pan and brown, in batches if necessary, for about 3 minutes. Remove. Reduce the heat to moderately low. Add the wine to the pan and cook, stirring to dislodge any brown bits that cling to the bottom of the pan. Stir in the tomatoes, 1/2 teaspoon salt, and 1/4 teaspoon pepper. Bring to a simmer. Return the veal to the pan. Cover and continue to simmer, turning the rolls once, until tender, about 25 minutes. Remove the veal from the pan. Add the spinach to the sauce and simmer until the spinach wilts and the sauce thickens, about 3 minutes. Remove the toothpicks from the veal rolls and serve the rolls with the sauce. Dolcetto d'Alba may taste too tart when drunk on its own, but it will shine when balanced by a tomato sauce such as the one here.